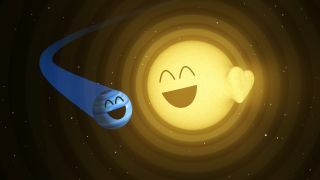 A NASA illustration of the exoplanet HAT-P-2b giving its parent star HAT-P-2 heartbeat-like pulsations. A gigantic exoplanet and its host star have a very special relationship, a new study suggests. The gas-giant planet, known as HAT-P-2b, induces heartbeat-like pulsations in the star every time the two bodies get close, according to the study, which is based on observations by NASA's Spitzer Space Telescope. HAT-P-2b and its parent star lie about 370 light-years from Earth, in the constellation Hercules. The planet, which was discovered in 2007, is about eight times more massive than Jupiter. HAT-P-2b's path is much more elliptical than the orbits of the eight officially recognized planets in our solar system, so it makes one close approach to the star every 5.6 Earth days. During each of these "flybys," the alien planet's powerful gravity pulls hard on the star, causing its outer shell to vibrate, the researchers found. Such interactions have been observed before, in binary "heartbeat stars." But the new study, which was published today (Feb. 14) in The Astrophysical Journal Letters, marks the first time a planet has been implicated in the phenomenon, study team members said. "It's remarkable that this relatively small planet seems to affect the whole star in a way that we can see from far away," study co-author Heather Knutson, an assistant professor of geological and planetary sciences at the California Institute of Technology, said in the same statement. HAT-P-2b is about 100 times less massive than its host star, the researchers said. For comparison, Jupiter is about 1,000 times less massive than the sun. The researchers spotted the pulsations after analyzing 350 hours of Spitzer observations, which were made between July 2011 and November 2015. The find came as a surprise. "We had intended the observations to provide a detailed look at HAT-P-2b's atmospheric circulation," said study co-author Nikole Lewis, an astronomer at the Space Telescope Science Institute in Baltimore. "The discovery of the oscillations was unexpected but adds another piece to the puzzle of how this system evolved." The heartbeat effect is slight; the star's oscillations are the most subtle light variations that the Spitzer Space Telescope has ever measured from any source, the researchers said. But modeling work indicates that the pulsations should be ever fainter, so there are more mysteries for the team to investigate. "Our observations suggest that our understanding of planet-star interactions is incomplete," de Wit said. "There's more to learn from studying stars in systems like this one and listening for the stories they tell through their 'heartbeats.'"